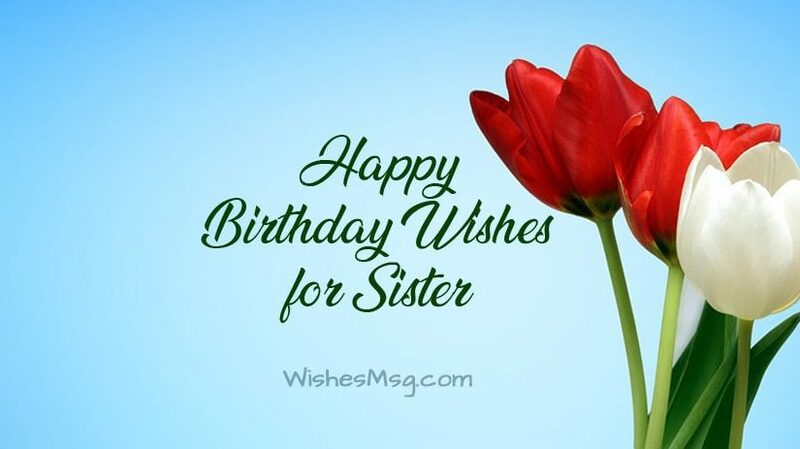 Birthday Wishes for Sister : The relationship between sisters and siblings is irreplaceable. It’s hard to find someone who doesn’t love his/her sister. It doesn’t matter if she is an adorable little one or protective elder one, you just can’t help loving them and caring for them. Sisters are the real caregiver for siblings who love them unconditionally. They are always ready to make her siblings happy even if it means compromising her own happiness. And when it comes to celebrating her birthday, you have a real chance of showing your gratitude for all that she did for you. 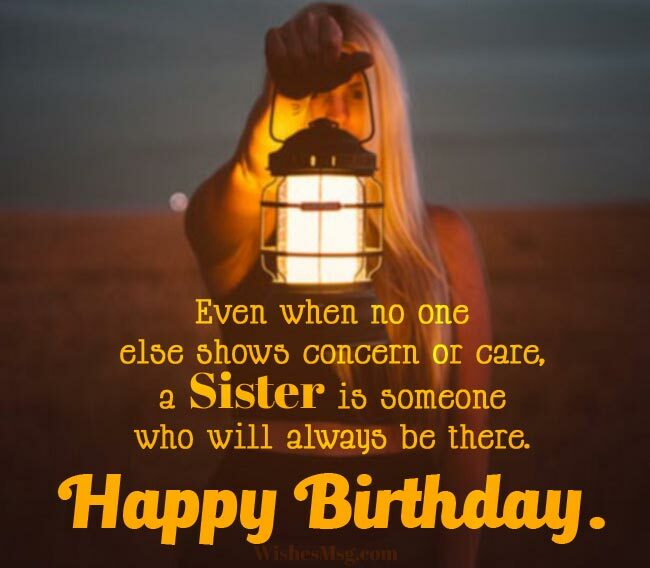 Here we have brought to you some truly mesmerizing birthday wishes for sister, happy birthday messages and greetings which will help you say happy birthday to your dear sister in the most gratifying way. I am very fortunate to have such a caring and loving sister like you. I want to thank you for everything and happy birthday sister. It feels good to see you getting more mature and beautiful every year. You are growing up like a princess. Happy birthday dear! People have idols who are celebrities, famous personalities. But I found my idol in you. I love the way you are and I respect it. Happy birthday to the amazing sister in the world. How time flies! I remember you started walking with those little legs, it felt just like yesterday. And now you are finishing high school. Happy Birthday sparrow. May you be showered with countless good wishes and many beautiful gifts. 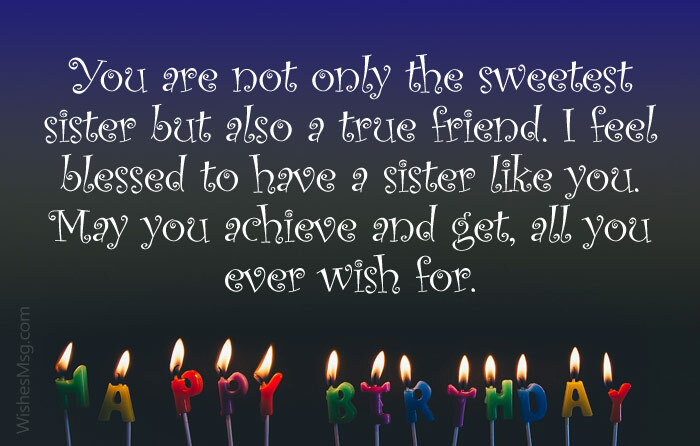 I wish you a happy birthday sister from the deepest corner of my heart! You are the person that I hold closest to my heart. There is no one in the world that I care for more than you. I wish you a lovely day today. Happy birthday! 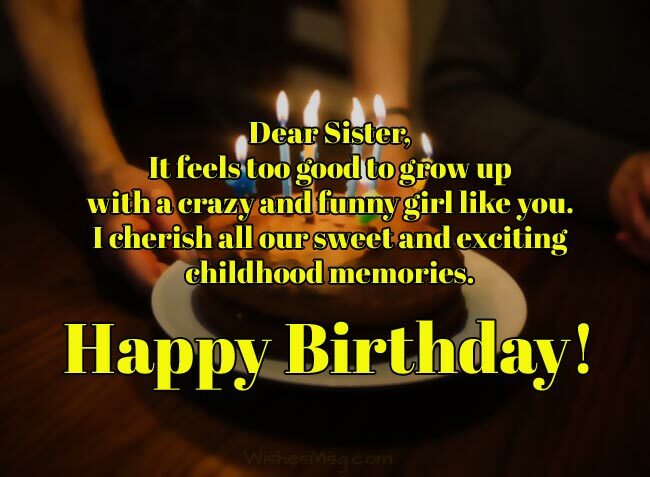 On this special day, I want you to know that you are the sweetest and loveliest sister in the world. I love you so much. Happy birthday! Younger sisters are the happiness of the house. They are the source of a smile for everyone. Birthdays of your younger sister should be celebrated with the sweetest birthday wishes ever. These are some of the most unique and exceptional birthday wishes for your little sister. Your younger sister will surely fall in love with these birthday wishes. Try these wishes to cheer her up on her special day. You will never find better birthday wishes for your younger sister than these. Though you have grown into a beautiful woman you are still that cute little panda. You used to stick to my side just like a baby panda. Happy Birthday panda. Dear, little sister. Though we fight like cat and mouse over little things, in the end, I will always give mine to you. Because you are my heart. Happy Birthday sweetie. Despite being the younger one, sometimes you act like you are the older one. I’m proud to have a sister like you who knows everything. Happy Birthday. May God bless you. You may be my little sister; it doesn’t mean you will fall short of my love. I love you with all my heart. Happy Birthday my sweet little sister. You are not older than me, but surely you are more beautiful than me. I wish I knew the secret of ageing so beautifully. Happy birthday! It doesn’t mater how much older you become; you’ll always remain to be my sweet little sister. Have a great day. Happy birthday! Some people are so nice that the earth feels blessed to have them in it. You are one of them, little sister. Happy birthday to you! Elder sisters are like our shelters. They are caring and kind hearted. No one understands you better than your elder sister. When it comes to her birthday, it is you, who should be making sure that she has a great time. It doesn’t matter how many gifts you buy her, or how big of a party you throw for her, at the end of the all that will matter to her is a heart-melting birthday wish from you. Thank God! That you have come first. Otherwise, I had to go through the Bulldogger of mom and dad. I thank you for that. Happy Birthday sissy. Happy Birthday my partner in crime. I miss those days when we were small and helped each other doing pranks on others. The celebration of this special day is not complete without a delicious dessert prepared by you. Happy birthday! Come back home! Are you coming home this time or I have to chase you there? Save me from the wrath of Mom. You know I love you; big sister and I wish you have the best birthday. No one understands me better than you. On this day, I wish you a very enjoyable birthday. I’m going to make sure you have a lot of fun. Happy birthday! May God bless you with wisdom and knowledge. You have been a blessing for all of us, especially for me. Happy birthday sister! Funny birthday wishes are for making her laugh with your witty and sublime jokes. Your sister deserves a big smile on her face on this special day. Forget about all the seriousness and double the cheerfulness of the special day with these funny birthday wishes. Your sister will be impressed when you add some humor in your birthday wishes. Check these very funny birthday wishes for sister! I always wanted a sister. I don’t know whether God has misheard my prayers because you seem more of a brother to me. Happy Birthday to my tomboy sister. I thought you’d always have my back. But I didn’t know you’d hide at my back every time mom gets angry on us. Happy birthday! You should feel lucky that I was born first. Otherwise, you wouldn’t have the chance to be here. 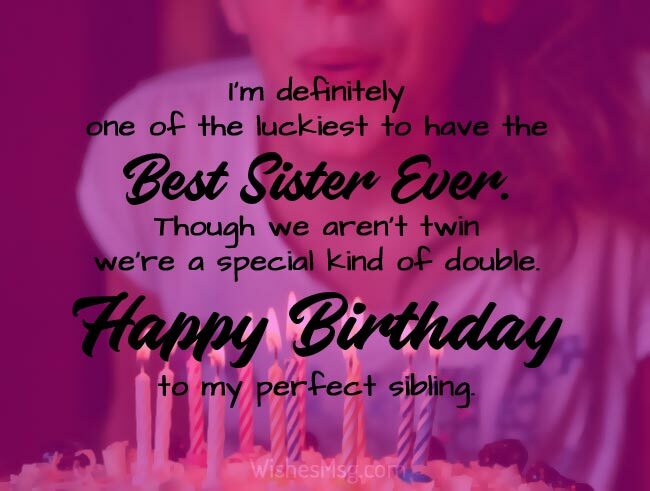 Though you didn’t thank me for that yet I am wishing you happy birthday twin. Your sister shares the same soul that you have in you but in a different body. Sisters are the true blessing from heaven. Often, we become very emotional while celebrating the birthdays of our sister. These emotional birthday messages are for those emotional moments which we don’t want to forget, but to keep them as our good memories. Here are some really emotional and heart-touching birthday messages for your sister that will melt her heart instantly! I know whatever I give won’t amount to the love you have given me. It’s unattainable. Happy birthday my loveliest sister. Every person has an angel in their life in the form of a human. You are that angel in my life. Happy Birthday sister. Looking at you gives me the strength to go on in life. You are the inspiration of my life. It’s a blessing to have a sister like you. I wish you to have the best birthday of your life. I saw you as a bud. You bloomed and grew into such an amazing lady. May you have the blessings of God and have the best things in the world. Happy Birthday. We are like two peas in a pod. Nothing is complete in my life without you, sister. Happy birthday to the other half of my soul. You have a good look, youthful appearance and a very charming presence but your stupidity overshadows everything else. Happy birthday! Your birthday is the only day in the year when I have to pretend like you are my favorite sister despite the fact that I hate you. Happy birthday! It always feels good to inspire someone with words. And when it comes to our sisters, we never want to miss any chance of inspiring them with our words and actions. Birthday is a good occasion for inspiring your little sister. 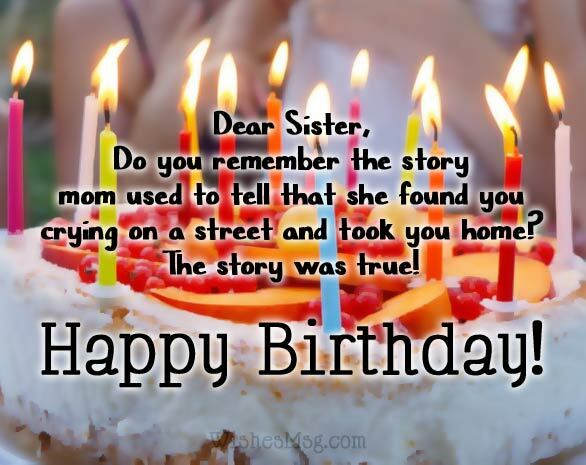 Make your birthday wishes full of inspiring words and let your sister feel the power of words. Ignite the fire that’s hidden inside their heart with these inspirational birthday messages for sister! I believe someday you’ll make all your dreams come true and make us all so proud. You are still so young but you have more potentials than any of us. Happy birthday! Your life is a gift from God. And God wants you to make the best use of it. Happy birthday dear sister. You are destined for glory! Stop worrying about what you couldn’t do, focus on what you still can do. You have a long way to go and so many things to accomplish. Happy birthday! Ageing happens to everyone, but not all of them grow wise as they grow old. It’s good to see you grow wiser and more mature every year. Happy birthday! Youth is the most powerful and mightiest of all the blessings people receive from God. Be grateful because you have it now. Happy birthday! A bad year cannot dictate your future. Forget what you could not accomplish last year because so many good years are still waiting for you. Happy birthday! 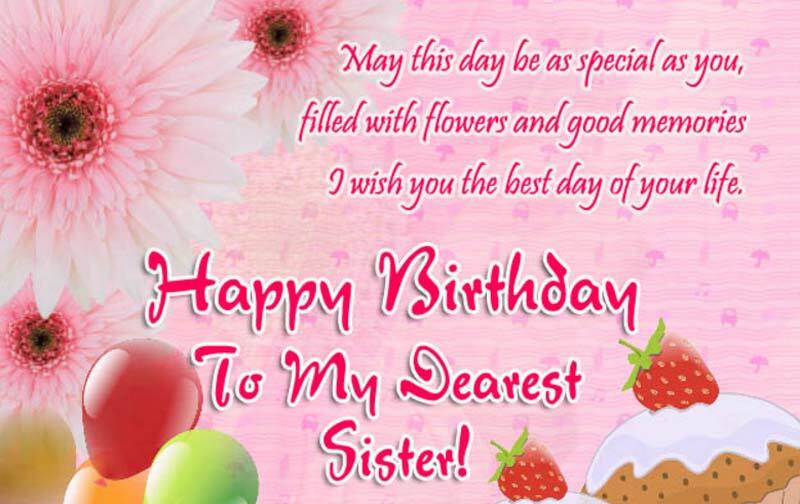 Birthday greetings for your sister are the first thing you need to make the day special for her. Your gifts may not last forever, the birthday party will be finished as soon as it starts, but the words you say to her and the texts you send to her will always remain in her heart. The birthday wishes and quotes we brought here for you are all so brilliantly composed so that you can express your true feelings for her. You can make her feel loved with these. You can also make her laugh with these. Always remember, your sister expects the best from you and she truly deserves the best one. These birthday wishes for sister are unlike any other message you’ll find. These are the very best birthday wishes for your sister that you’ll ever find.